There are two methods for cooking up a tasty plate of brussels sprouts. You can roast them in your oven on high heat, or blanch them on the stove top. I'll include both techniques since this recipe tastes great both ways! If you tend to love the crispy, slightly caramelized flavor of roasted veggies, I say go that route, but if you prefer them a bit more firm and fresh then blanching is for you. First wash and trim your sprouts, removing the stem from the bottom as well as any leaves that look yellowed or a bit worse for wear. Next, choose your cooking method! Cut brussels sprouts in halves or quarters. Add to a sheet pan and drizzle with olive oil. Season with salt and pepper and roast for 30-35, until crisp on the outside and tender on the inside. Add the cranberries at the 15-20 minute mark, shaking the pan first to evenly roast the sprouts. Fill a pot or high-sided pan with 2 cups water and set to boil on the stove-top. This should be enough liquid but if you're using a deep pan or extra sprouts, you may want to double the amount of liquid. If you have orange juice on hand, I love replacing one cup of water with orange juice to infuse the sprouts with citrus flavor! Once it reaches a rolling boil, add the sprouts and blanch/boil for a just a few minutes until sprouts turn bright green and are tender enough to be pierced by a fork. You'll want them to "give" a little when pierced. I always slice one in half and taste test for tenderness. Plop the sprouts in a bowl of ice water to shock them and halt the cooking process then remove using a slotted spoon. 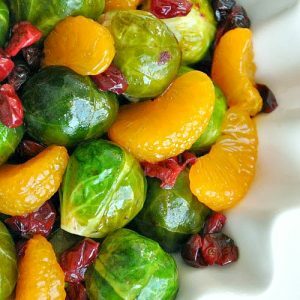 When you're ready to eat, slice the brussels sprouts in half, heat up a pan with a little bit of your blood orange olive oil and a pinch of salt and saute until tender and warm. Since you blanched them first they're be green, gorgeous, and saute very quickly! If you choose blanching as your method, roast the berries while you blanch the sprouts! Simply drizzle them with a little oil and roast at 400 for 15 minutes. Whisk together your glaze (it'll resemble a sugary paste) and add to your veggies. For roasted veggies I just toss it all into a bowl and mix well. For the stovetop method, simply add it to the sauté pan and mix it all up while the veggies are still hot. Add in your orange segments and gently mix to distribute. Dive in while it's hot! Looking for my favorite fruity olive oil? You can snag orange-infused olive oil at many large supermarkets, at olive oil bars (they're popping up everywhere! even my teeny middle-of-nowhere town has one!) and on Amazon as well. No orange olive oil? No problem! Feel free to use your favorite variety of plain olive oil or even avocado oil. The photos are of the stove-top blanch/sauté method. If roasting the sprouts will be a bit more crispy and golden brown around the edges. They're crazy delicious all the same!